I put up some cloths for an internet auction because my children (and I) grew out of them. I started putting up our unwanted items for internet auction about twenty years ago. I usually use Yahoo, it's surprising how much it has progressed. Twenty years ago, I emailed bidders using my own email address, but now, I don't have to let them know it because we can use the convenient navigation system to contact bidders. Getting payment from bidders is quite easy now. Exhibitors need to register the bank account which they would like to receive payments into in advance. It's revealed to bidders only when they make a successful bid and need to pay to bidders. The process of auctioning got much easier and quicker than before. But due to this, bidders can get items without sending any messages to exhibitors. Using the navigation system, you can only click the buttons to inform users that have finish transferring payments, receiving items. And you can evaluate exhibitors using fixed form sentences which are prepared in advance, so that most evaluations are same responses, even though they are evaluations by many different people. It's a bit disappointing for me. When I sent an email to the bidder from my email account, her reply attached a computer virus. Since she didn't notice it, I got rid of the virus from my laptop and emailed her to inform that her computer might be infected with a computer virus and how to clean it. After a while, she sent me an email and thanked me. I was really glad that I could help her. I have also received a call from one of the bidders. He asked me to send the item quickly because it was a ticket for a golf competition which was to be held in a week. "Thank you for sending the ticket so quickly, I was able to receive it before the competition. I'm looking forward to seeing it!" I like such communications with bidders. I am glad to know that bidders are glad to receive my items. In my case, I try to send messages to inform on the progress of the auction to the bidders. I try to answer questions form bidders kindly and politely. I evaluate bidders using my own words. Convenience and ease of use are important, but I think an exchange between people is more important. I did not know that Yahoo did auctions. I use Ebay and PayPal which makes buying things from internet websites easier for me. I put up some cloths for the internet auction because my children (and I) grew out of them. I started putting up our unwanted items for the internet auction about twenty years ago. I usually use Yahoo, it's surprising for its progress. I usually use Yahoo, it's surprising (how much/how far ) it has progressed. I usually use Yahoo, it is surprising how much progress it has made. Exhibitors need to register the bank account which you would like to receive payments in advance. It's informed to bidders only when they make a successful bid and need to pay to bidders. It's (revealed/given) to bidders only when they make a successful bid and need to pay to bidders. The process of auction got quite easier and quicker than before. The process of auctioning got (quite a bit/much) easier and quicker than before. Using the navigation system, you can only click the buttons to inform that you finish transferring payments, receiving items. And you can evaluate exhibitors using fixed form sentences which prepared in advance, so that most evaluations are same as a result even though they are evaluated by every person. And you can evaluate exhibitors using fixed form sentences which are prepared in advance, so that most evaluations are the same responses, even though they are evaluations (from/by) many different people. Since she didn't notice about it, I got rid of the virus from my laptop and emailed her to inform that her computer might be infected with the computer virus and how to clean it. Since she didn't (know about/notice) it, I got rid of the virus from my laptop and emailed her to inform her that her computer might be infected with a computer virus and how to clean it. He asked me to send the item quickly because it was a ticket of golf competition which was hold in a week. He asked me to send the item quickly because it was a ticket (for/to) a golf competition which was to be held in a week. "Thank you for sending the ticket so quickly, I could receive it before the competition. I'm looking forward to seeing it!" "Thank you for sending the ticket so quickly, I (was able to receive/received) it before the competition. I'm looking forward to seeing it!" I am glad to know that bidders are glad to received my items. I am glad to know that bidders are glad to (have received/receive) my items. In my case, I try to send messages to inform the progress of the auction to the bidders. In my case, I try to send messages to inform bidders on the progress of the auction. Convenient and easy are important, but I think an exchange between people is more important. A website that is convenient and easy to use is important, but I think an exchange between people is more important. Thank you for a lot of corrections! I didn't know that "auction" can be used as a verb. 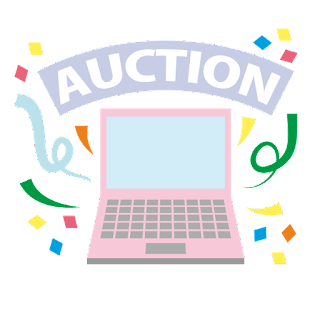 It took time to write this article because I didn't know the vocabularies related to auction. I would like to remember and use them in a real conversation. Yes the word auction can be used in noun and verb ways. I like auction sites they are fun. I auctioned the clothes in the afternoon. I sent the painting (to auction/to be auctioned). I am in the process of auctioning clothes. To auction clothes is easy. The act of auctioning clothes is a thing I am skilled (at/in). I decided to auction everything. I put everything up for auction. An auction is a good way to buy things inexpensively. Cloths clean dishes, plates and windows and other surfaces. Clothes are the items of clothing you wear. Sorry for my missing it. What color will your Karate belt be next?